Is a serial killer lose in the city? One who will keep killing until Nolan stops him? 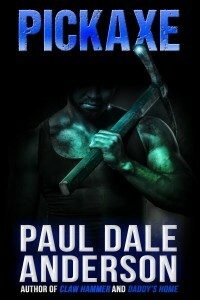 PICKAXE is available from Amazon and Barnes & Noble. Paul Dale Anderson is the author of Abandoned, Deviants, Claw Hammer, Daddy’s Home, The Devil Made me Do It, Running Out of Time, and more than 17 novels and hundreds of short stories, mostly in the horror, fantasy, and science fiction genres. Paul is an Active Member of SFWA and HWA, and he was elected Vice President and Trustee of Horror Writers Association in 1987. He is a current member of International Thriller Writers and a former Active Member of MWA. Paul has taught creative writing at the University of Illinois at Chicago and for Writers Digest School. He has appeared on panels at Chicon4 and Chicon7, X-Con, Windy Con, Madcon, Minncon, the World Horror Convention, and the World Fantasy Convention. Paul was a guest of honor at Horror Fest in Estes Park, Colorado, in 1989. He is currently the chair of the 2014 HWA Bram Stoker Awards Long Fiction Jury.